Home Tags Posts tagged with "Cross Challenge senior races"
Charlie Hulson (coach: Steve Vernon; club: Liverpool Harriers) & Anna Moller (DEN) kicked off the 2018/19 Cross Challenge senior races with the first maximum points hauls at Llandaff Fields in Cardiff. 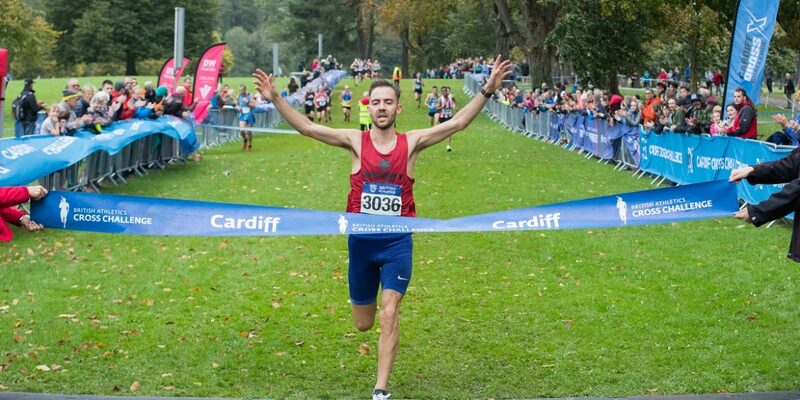 Hulson, who finished third on his last visit to Cardiff in 2016, was in the mix throughout the 9.4km course alongside Mahamed Mahamed (Peter Haynes; Southampton AC) and 2014/15 series champion Adam Hickey (Southend), but found another gear in the closing stages to win in 29:53. Defending Cross Challenge champion Mahamed crossed the line second in 29:54, with Hickey third, holding off Jack Gray (Cambridge & Coleridge), stopping the clock at 29:57 and 29:58 respectively. Hulson is continuing his return to action and feels his performance in Cardiff is a good barometer to gauge where he is at for the forthcoming season. He said: “I’m feeling good, I’m just still trying to get back into the swing of things but the result gives me a massive boost for the rest of the season and I want to carry the momentum on. “I’m working hard and it all seems to be going well. Because of the wind on the course, I sat in a little bit on the opening lap and I didn’t know what shape I was in. I used my strength and tested the water on the second lap, but all the guys were up for it. The senior women’s race saw Denmark’s Anna-Emilie Moller claim the first victory of the season in a solid 21:48, putting together a composed race to hold off the challenge of Kate Avery (Shildon). The European U23 3000m steeplechase champion led the leading group of 11 through the first lap, before a kick early in lap two reduced the pack to four. The European Junior Cross silver medallist in 2016 kicked again in the second half of the final circuit and came on even stronger in the closing stages for victory. Avery clocked 21:52 as she took to the Cross Challenge circuit for the first time in almost a year, while a good run from Emily Hosker-Thornhill (Mick Woods; AFD) saw her third, a further two seconds back and Jess Judd (Mick Judd; Chelmsford) fourth in 22:04. After the race, Avery assessed: “It was tough. I’m really happy with how I performed because I’ve just been getting back into training sessions and I’m really pleased with how I did. It wasn’t as bad as I expected it to be. Jake Heyward (James Thie; Cardiff) retained his U20 crown in Cardiff with a well-measured race on the 6.4km circuit, easing to victory and stopping the clock at 19:56. The IAAF World U20 Championship 1500m finalist was in the mix at the end of the first lap in the leading group of 10 before pulling well clear midway through the second loop to win by over 30-seconds from U17 series champion Rory Leonard (Morpeth). Oliver Barbaresi (Andrew Walling; Menai) required a sprint finish to hold off Elliot Lawrence (Swansea) for third, with European U18 3000m gold medallist from Gyor Thomas Keen (Mark Vile; Cambridge & Coleridge) sixth in 20:50. U17 champion Grace Brock (Cornwall AC) picked up where she left off last season with a gun to tape victory in the women’s U17/U20 race, clocking 15:32 in the process. She attacked the course from the start, opening up a small lead at the end of the first lap, and completed her gun to tape victory in style, winning by a clear 100m. Khy Mhlanga (Mick Judd; Herts Phoenix) and Cari Hughes (Andrew Walling; Swansea Harriers) pushed each other all the way, but it was Mhlanga who produced a powerful kick in the final 400m to take second in 15:42, with Hughes following her home in 15:50. Anna MacFayden (Forres) ended her 1100-mile round trip to the Welsh capital with a strong fourth place, while Cera Gemmell (Henry Muchamore; Team East Lothian) was the first Under-17 home, clocking 16:17. Mohamed Ali (Ealing Southall & Middlesex), who smashed national records on his way to a series win last season, kicked off the U17 series with a dominant performance, leading all the way to take his first maximum of the series. Matt Stonier (Peter Mullervy; Invicta East Kent) followed Ali home under pressure from Archie May (Jason Marchant; Dartford Harriers), the trio split by just two seconds overall, with the duo clocking 17:54 and 17:55 respectively. Holly Weedall (Vale Royal) continued her excellent form on the Cross Challenge circuit with her first victory of the season in the U15 girls race in 11:22, edging Samila Jones (Menai), who finished a further seven seconds back. The first full complement of points in the men’s equivalent went the way of Kyle Rabjohn (Richmond & Zetland) in a sprint finish from James Wardle (Graham Moffatt; Rushcliffe), stopping the clock at 10:19, bettering Wardle by just one second. Josie Robertson (Newbury) kicked off her Girls U13 Cross Challenge campaign in perfect fashion as she took victory from Scarlett Livingstone (Exeter) in a tight finish over the 1.25km course, while William Rabjohns (Mark Pauley; Poole AC) streaked to victory in the boys’ equivalent. The series continues in Milton Keynes on Saturday, 10 November at Teardrop Lakes.